Greek Orthodox Church Sells Land In Israel, Worrying Both Israelis And Palestinians : Parallels Greek Orthodox Church leaders have quietly sold off several properties and leases to Israeli, Jewish and anonymous investors fronted by companies registered in far-flung tax havens. 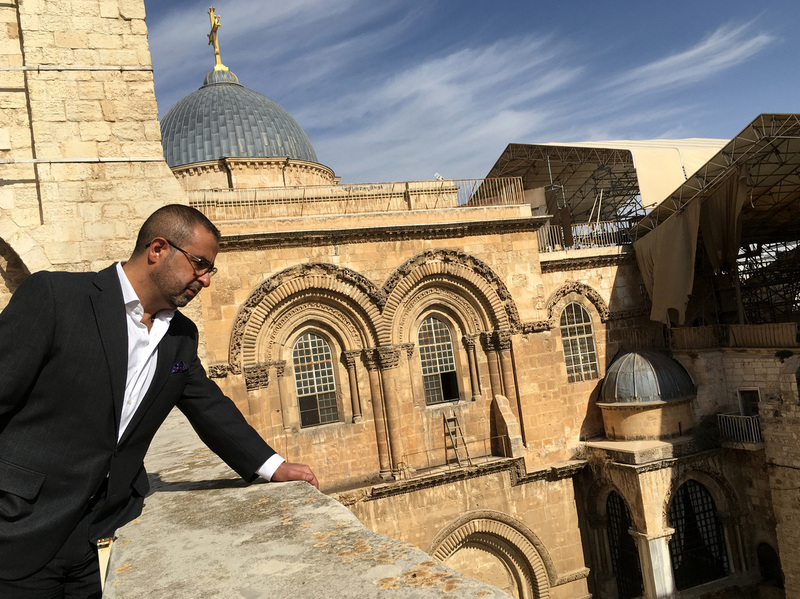 Dmitri Diliani, a Palestinian member of the Greek Orthodox church, stands on the roof of the Greek Orthodox Patriarchate of Jerusalem overlooking the Church of the Holy Sepulcher, which houses the traditional tomb of Jesus. Secretive real estate deals in the Holy Land are putting one of Jerusalem's most powerful and ancient churches in the spotlight. The Greek Orthodox Church calls itself the second-largest landowner in Israel, after the Israeli government. It says it owns some 30 percent of Jerusalem's walled Old City, the city's historic core, and controls the largest stake of any Christian denomination in the Church of the Holy Sepulcher, home to the traditional tomb of Jesus. It also owns lands throughout Jerusalem, Israel and the West Bank. But in recent years, church leaders have quietly sold off several properties to anonymous investors fronted by companies registered in far-flung tax havens. Israeli and Jewish businessmen were later identified as some of the buyers. These deals have only recently become public, raising panic among Israelis whose apartments are built on church land and leading to small but growing public protests by some Palestinian church members. The church leadership is dominated by Greek nationals, but the church's local following is largely Palestinian. Some Palestinians are worried about possible implications for their quest for independence. "We are concerned because these are the properties of the church. And these properties are diminishing year after year," said Hanna Amireh, a Palestinian official in charge of church affairs. "This is part of our land, in a way or another. We don't want this land to be sold ... to our enemy." The question of landownership strikes at the core of the Israeli-Palestinian tug of war over Jerusalem. Israel captured East Jerusalem, whose holy sites include the Church of the Holy Sepulcher, Al-Aqsa Mosque and Western Wall, in 1967. But the Palestinians demand that part of the city as the capital of a future independent state. The land dispute saga began a decade ago at Jaffa Gate, the most prominent entrance to the Old City of Jerusalem, where throngs of pilgrims pass on their way to the city's most revered religious sites. Just inside the gate are two hotels run by Palestinian families but owned by the Greek Orthodox Church. In 2005, an Israeli newspaper reported on a secret deal struck the year before by the Greek Orthodox Patriarchate — the church leadership — to sell the hotels to Ateret Cohanim, a Jewish settler group that aims to buy up Palestinian-owned properties in strategic locations in Jerusalem to increase Jewish control in the contested city. The church's sale caused an uproar among Palestinians in the Greek Orthodox community. Then-Greek Orthodox Patriarch Irenaios I was accused of conspiring to sell the property. Rumors swirled about the patriarch's relationship with the young man who conducted the secret property deals with the patriarch's power of attorney. The scandal led to Irenaios' ouster – sparking yet another drama. 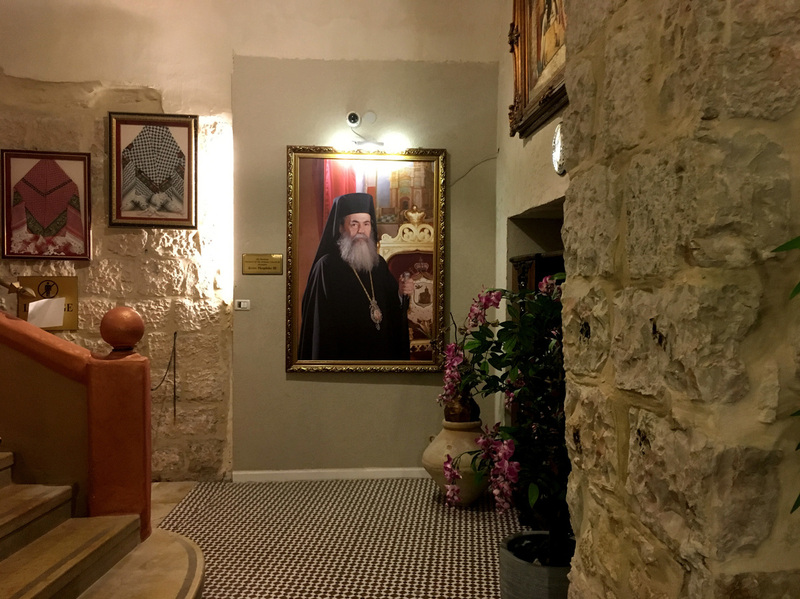 The portrait of Patriarch Theophilos III looks over the entrance to the East Imperial Hotel in the Old City of Jerusalem, a property the previous patriarch sold to a Jewish settler organization in a controversial sale that led to his ouster. Patriarch Theophilos is fighting to annul the sale in Israeli court. For years, Irenaios holed himself up in his apartment in the church headquarters in Jerusalem's Old City, refusing to accept his expulsion and afraid he would be locked out if he left the premises. A sympathetic Palestinian grocer brought him food, which Irenaios hoisted up to his window by rope. A new church leader was appointed, Patriarch Theophilos III, who is fighting in Israeli court to annul the sale of church-owned properties in Jaffa Gate during his predecessor's tenure. A lower court recently deemed the sale to be proper, and the patriarch is appealing to Israeli Supreme Court. But Theophilos is now on the defensive. News first broke this summer about additional land deals, which he personally approved. More details about the land deals have been reported in the Israeli press in recent weeks and months. Many of the deals in question are of lands that the church leased in the 1950s to institutions affiliated with the Israeli government, like the Jewish National Fund, a century-old nonprofit dedicated to obtaining land and developing Jewish communities in Israel. The church sold lands in the upscale beachside cities of Caesarea and Jaffa to companies registered in the Caribbean. In other deals, Israeli investors purchased large tracts of land in the most luxurious neighborhoods of West Jerusalem. When the long-term lease on the land expires in a few decades, these companies will decide the fate of the apartments on those lands. Leaseholders in the area say their property values have dropped drastically because of the uncertainty. "I am not doing any renovations," said Nava Bat-Zur, whose apartment is on land sold by the church. "It is hard to sell these properties." She has helped rally residents to lobby Israeli authorities to do something to resolve their predicament. 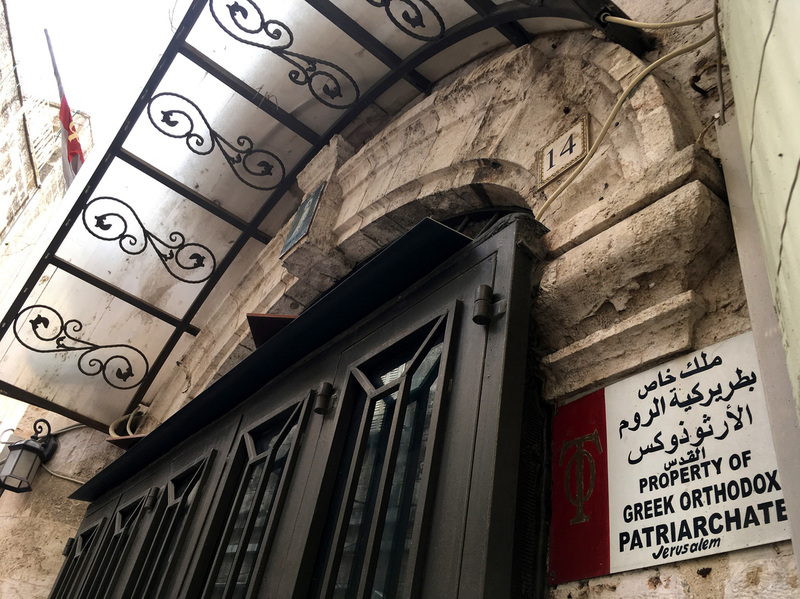 Amid controversy over real estate deals in the Holy Land, the Greek Orthodox Patriarch is conducting a rare public campaign to drum up support for churches' property rights. A bill in the Israeli parliament is proposing that the government immediately expropriate Greek Orthodox Church lands if they are sold to private investors. That has alarmed Jerusalem-based churches of many denominations, and the Greek Orthodox Patriarch is now conducting a rare public campaign, recording a video message in English that warns of of an "assault" on the church, and taking an international tour — meeting with the pope, the archbishop of Canterbury and other faith leaders — to drum up support for churches' property rights. Local Palestinian church members argue whether the property sales are actually benefiting the local flock. "All that [money] was put in projects that serve the preservation of the Christian community in the Holy Land" like church-run schools and a housing project for Palestinian church members in East Jerusalem, said Dmitri Diliani, a Palestinian church member supportive of the patriarch's deals. Ghassan Munayyer, a Palestinian citizen of Israel and member of the church who opposes the land deals, argues that other churches in the Holy Land invest more in their local flock than the wealthy Greek Orthodox Church does. He says the patriarch has not reached out to the community to explain the recent land deals. "We ask always: 'Why you disgrace us? Why you hate us so much?' " said Munayyer. "You don't invest anything in the local community. And now you sell our land." The church has conducted some two dozen major land deals in Israel, the West Bank and Jerusalem in recent years, according to a Greek Orthodox Patriarchate official who spoke to NPR on the condition of anonymity because he was not authorized by the church to speak openly about the matter. The official offered a defense for some of the recent land deals. In the case of the Jewish National Fund, he said the fund asked the church to renew its lease on a large tract of land in the Jerusalem neighborhood of Rehavia. The lands were leased to the JNF in the early 1950s for a period of 99 years, and the JNF wished to negotiate a new lease early. The church said the JNF made a low offer for the new lease, and the church felt its hands were tied, believing it could not actually reject the offer and evict the tenants from their upscale neighborhood. In addition, he said, the church was under pressure from Israeli officials about extending the lease of the land. So the church sold the land to an Israeli investor and got rid of a "headache," the official said. Other church properties were sold, either to generate income or to get rid of properties that had caused the church problems, he said. One was sold after the church was found in breach of the lease and an Israeli court ordered it to pay millions of dollars in damages, even threatening Israeli expropriation of a Greek Orthodox monastery property in a politically sensitive part of East Jerusalem, the official said. "None of these deals are endangering the future dream of the Palestinian people. None are siphoning off endowments," the official said, referring to churches and monasteries considered to be ecclesiastical holdings. In a city contested by both Israelis and Palestinians, the story of church-owned land in Jerusalem has always been sensitive. A former Israeli city planner, Israel Kimhi, said he mapped out all the church-owned lands in Jerusalem for an atlas he helped prepare in the early 1970s. But he said the Israeli government censor prohibited the map from being released to the public. "To see the amount of land that is owned by others, not by Israelis, in those very sensitive areas — at that time, the government decided it was not a good thing to show," Kimhi said. As the public learns more about the Greek Orthodox Church's holdings, it has opened a Pandora's box of worries about the city's future — because other churches own lands and properties in Jerusalem. Some fear that investors with deep pockets and ideological ambitions — Israelis wanting a toehold in a Palestinian area of the city, or vice versa — might pressure a church into selling a property, giving Israelis or Palestinians one more win in the real estate battle for control in the city.